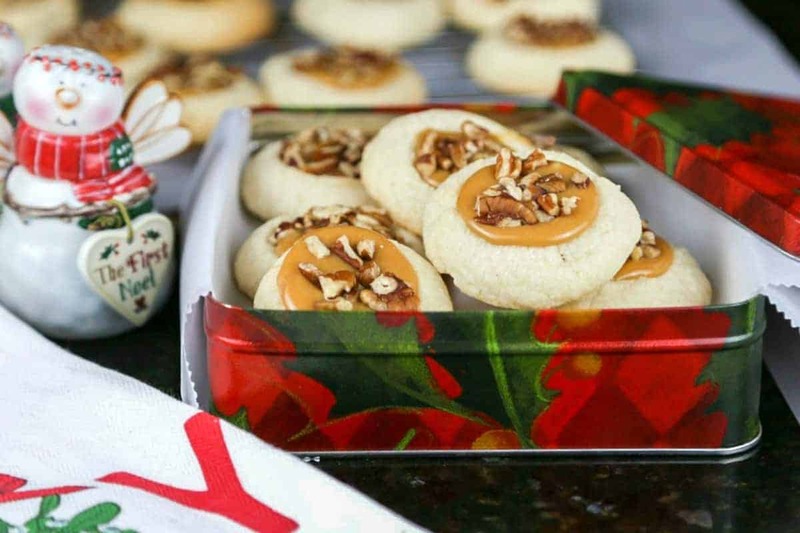 The Sweetest Season Cookie Exchange is celebrating its SIXTH year of spreading holiday cheer through a virtual cookie exchange! Follow along all week to get delicious cookie recipes from a great group of bloggers who are spreading the word and raising money for a good cause. 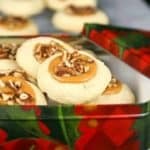 The recipe I’ve chosen to “swap” is for Caramel Pecan Thumbprint Cookies, a buttery shortbread cookie with a creamy caramel center topped with toasted pecans. These cookies have been hubby taste-tested and approved! Since Christmas is the season of giving as well as a magical time for children of all ages, we’re partnering with the children’s charity, Cookies For Kids’ Cancer, to raise money throughout the entire month of December. Did you know that cancer is the #1 cause of death of children by disease in the U.S.? There are 40,000 U.S. children actively battling cancer right now. With less than 4% of the National Cancer Institute’s budget going to all childhood cancer combined, I knew it was important for me to get involved. Won’t you help us make a difference by donating to Cookies for Kids’ Cancer? Other than chocolate chip, shortbread cookies are one of my all-time favorites and I’m totally in love with this creamy caramel filling! Shortbread originated in Scotland and is traditionally made from one part sugar, two parts butter, and three parts flour. When baked, shortbread will appear to be almost white, so don’t fret about cooking until lightly browned. These cookies are done when they appear dry and are firm to the touch. Allow them to cool completely before filling with the caramel and serving as they may be crumbly when still warm—they will firm up as they cool. Please help us make a difference by donating to Cookies for Kids’ Cancer. Merry Christmas! Position rack in center of oven and preheat to 350 degrees. Line two cookie sheets with parchment paper and set aside. In a large bowl, beat butter, powdered’ sugar, vanilla, and salt on medium speed until well blended and smooth, about 3 minutes. Scrape down the bowl and beaters and add flour. Mix on low speed until a soft dough forms, about 1 minute. Form the cookies by using your palms to roll our 24 smooth balls approximately 1 to 1-1/4 inches in diameter. Place about 1-1/2 inches apart on the lined cookie sheets. Dip the back of a 1/2 teaspoon measure into flour, then press down into the middle of each cookie almost as deep as the dough ball. Reform any cookies that crack or break. Bake for 15 to 20 minutes or until the tops look dry and the edges are lightly browned. Bake one sheet of cookies at a time if both sheets will not fit on the same middle rack. Let the cookies cool on the cookie sheet for 5 minutes and then transfer them to a wire rack to cool completely. Unwrap the caramels and place in a small saucepan with the heavy cream. Cook over very low heat, stirring constantly, until the caramels have melted and the mixture is smooth, about 4 to 6 minutes. 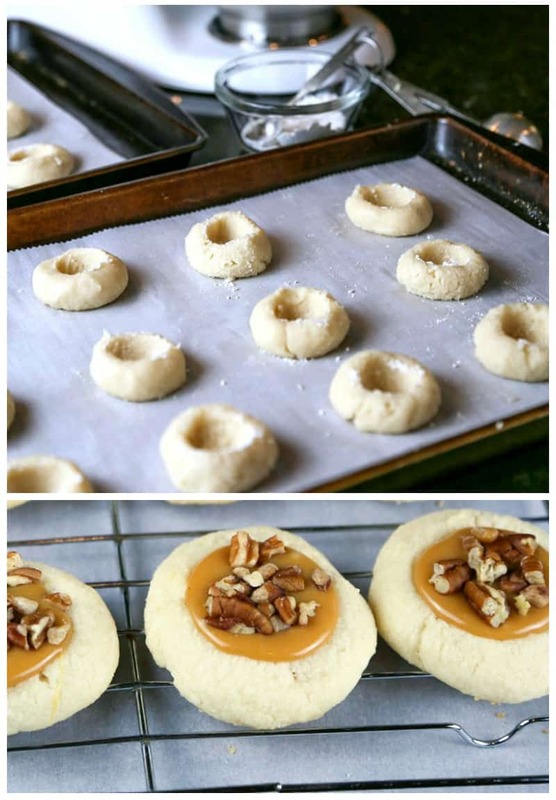 While the caramel is still warm, use a small spoon to fill each cookie indentation, filling to the rim but not overflowing. 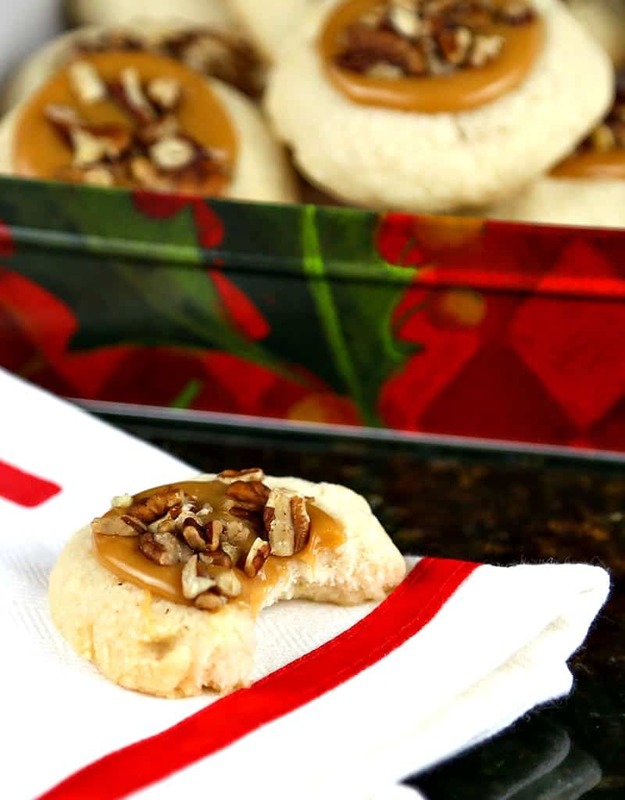 Sprinkle pecans on top of each cookie and press lightly into the caramel. Cool completely before storing. Original recipe found in the Fine Cooking 2017 Christmas Guide. Mmmm what a great flavor combo! I love the look of these. Definitely a must-try this Christmas season! These cookies look delicious! I love that you are raising funds for cancer research for children. Thank you for sharing the link! These look so delicious! Love this alternative to traditional thumbprints—these are definitely going on my cookie trays this year. My family would LOVE these! They always love pecan desserts and I always love caramel – win win! It has been so much fun seeing everyone bring a cookie to the mix and help raise awareness and money and spread cheer. 🙂 Thank you, thank you, thank you for participating in this year’s Sweetest Season Cookie Exchange! That little pool of caramel looks like PERFECTION! What gorgeous cookies! Such a great recipe for a great cause. I love this thumbprint filling idea. I’m a firm believer you can never go wrong with caramel!